And website for parents, Now you can speak directly to your customers. The Tucson Parent was created to meet the mutual needs of Paretns and Merchants for a medium that is convenient for parents to use and a good economic value for advertisers. Our marketing is direct to you, our customers. We try to keep it simple and serve our community. With competitive prices that make this advertising a great value! The Tucson Parent distributes the publication to create customers for you. Our multi-faceted distribution puts your ad directly in the hands of potential customers. 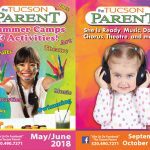 We distribute The Tucson Parent by use of an email list generated by parents voluntarily registering for a free online subscription. Additionally, the publication is placed in the offices of obstetricians, pediatricians, familu physicians, pediatric subspecialists, libraries, Peter Piper Pizza Stores, the Tucson Mall and Bookman’s book stores. As couples learn they are to be parent’s they visit their obstetrician and eventually the pediatrician. During each visit, they will have an opportunity to pick up a copy of The Tucson Parent.